Headlining our third annual String Theories Festival is our world premiere performance of Solo, commissioned by the SOB and written by W4 New Music Collective. Whether by choice or circumstance, there are times that we walk the road alone. 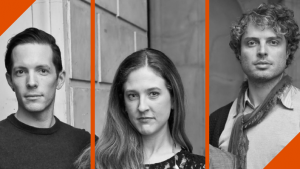 Acknowledging these moments in their own lives, composers Matt Frey, Tim Hansen, and Molly Herron have collaboratively created Solo, a multi-movement instrumental work for The String Orchestra of Brooklyn. A rotating cast of soloists from every section of the orchestra highlight movements expressing different aspects of solitude. Each composer makes a personal connection with a poet from the past to inspire their work: Sara Teasdale, Hafez, and Rainer Maria Rilke, poets who have written extensively on self-truth and individuality.